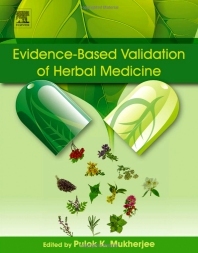 Evidence-Based Validation of Herbal Medicines brings together current thinking and practice in the areas of characterization and validation of natural products. This book reviews all aspects of evaluation and development of medicines from plant sources, including their cultivation, collection, phytochemical and phyto-pharmacological evaluation, and therapeutic potential. Emphasis is placed on describing the full range of evidence-based analytical and bio-analytical techniques used to characterize natural products, including –omic technologies, phyto-chemical analysis, hyphenated techniques, and many more. Prof. Pulok K. Mukherjee is a fellow of the Royal Society of Chemistry (FRSC), UK and the fellow of the National Academy of Science (FNASc), India. He is working as the Director of the School of Natural Product Studies, Department of Pharmaceutical Technology, Jadavpur University, Kolkata, India. His work on integrated approaches for traditional medicine-inspired drug development through chemo-profiling, quality control, pharmaco-vigilance, safety surveillance, risk assessment has achieved worldwide acclaim. He has made significant contributions in the area of evaluation and validation of medicinal plants, Ethnopharmacology, and ethnomedicine. He has contributed over 200 publications in peer reviewed impact journals and has several patents. He has also published several well acclaimed books including Evidence-Based Validation of Herbal Medicine (Elsevier); Evaluation of Herbal Medicinal Products (Pharmaceutical Press), and many others. Prof. Mukherjee has been honoured with several awards and laurels from both the Government of India and abroad. For further details please visit www.pulokmukherjee.in.